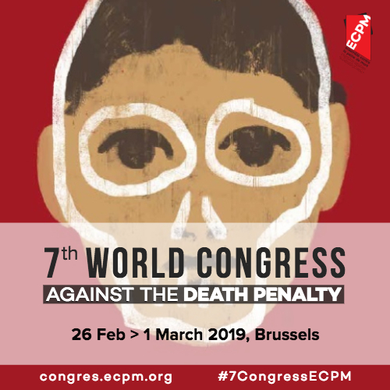 27 FEBRUARY 2019, BRUSSELS, BELGIUM – On Wednesday morning, abolitionists from around the world gathered in Brussels for the 7th World Congress Against the Death Penalty organized by the “Ensemble Contre la Peine de Mort” association (ECPM) in partnership with the World Coalition Against the Death Penalty. This was also an opportunity for the European Union to make a strong commitment against the death penalty and to underline the importance of the work carried out by activists around the world. Due to its experience in defending that human dignity is present from conception to natural death, World Youth Alliance Europe was invited to the opening ceremony and got an insight of the last successes and further aims in the abolition of this practice. In 2018, 146 countries and territories have abolished the death penalty either in law or in practice. However, there are still citizens of 52 countries (representing approximately 60% of the world population) that live under the yoke of a justice system allowing death penalty. Additionally, more than 20,000 prisoners that are sentenced to death await execution in conditions of detention which are often well below than what was required according to international standards. Sexual and ethnic minorities, poor people and women are often affected. In some countries, witchcraft, apostasy and homosexuality are still seen as crimes punishable by death. Belgium’s Prime minister Didier Reynders underlined that the death penalty undermines human dignity and represents a clear violation of human rights. He admonished not to forget the families of the victims and above all, the children that are suffering their whole life due to their parent’s death. Raphael Chenuil-Hazan – Executive director of ECPM in France – held an energetic speech in which he claimed to mobilize private companies to sanction their deliveries that are necessary for the execution of prisoners. Inter alia, pharmaceutic companies should stop delivering lethal substances that are injected in the victim’s body during execution. He said “death penalty is not (a) method to scare people”: such level of State’s violence isn’t a deterrent to stop people from committing crimes. A simple but strong statement came from Pope Francis through a video message: “Life is a gift and no one can take this gift away”. No one can lose his dignity, even after committing a crime. They should be given a chance to change themselves. Poet and lawyer Vanessa Place decided to share her thoughts through a poem in which she described the real case of an execution that went wrong where the victim had to die consciously and thus under strong pain. She was not the only person that presented her opinion through art: Tyvh Barrow, a Belgian singer gave a small concert and Ndume Olatushani, formerly sentenced to death, presented a painting created especially for the Congress. Many different speakers talked and shared they messages but one thing was clear for everyone: It is our obligation to protect human dignity, the right to life and to be just. As it was stated, “justice is fairness, and fairness is not found in killing people”. This practice is still in force in China, some parts of Africa, the USA and the Middle East. This congress already mobilized many countries in the past years to abolish death penalty and the impact was great. Many organizations and events were created and the awareness is rising steady. In the Declaration on Good Governance on the WYA website we find the sentence, “Leaders bear a particular responsibility to uphold the dignity of the human person in their governance; in exercising this responsibility, they earn the trust of the community.” WYA believes that the States’ duty is to protect the human life and to support a trustworthy relationship with its citizens. WYA sees its obligation to motivate young people to stand up for the abolition of death penalty and to advocate for the alienable human dignity of every human being. We will stay updated about further effects after the congress and continue supporting a culture of life in our society. You may watch the Opening Ceremony of the 7th World Congress Against The Death Penalty here.